With Office and Windows, inking lets you harness the digital world through the power of touch, create in more natural ways, and translate your vision into reality. Scribble with your pen, then convert your ink to text with the push of a button. Select Draw, then choose a pen. Click the tool box, then select Text. Use your finger or pen to edit with natural gestures, like circling to select and crossing out to delete. Select Draw > Ink Editor, then choose a pen. Edit your document with natural gestures. Circle, cross out, draw, and insert. Draw, sketch, or write with color with your finger, a pen, or a mouse. Select the down arrow, then choose a thickness and color. Draw, sketch, or write with color. 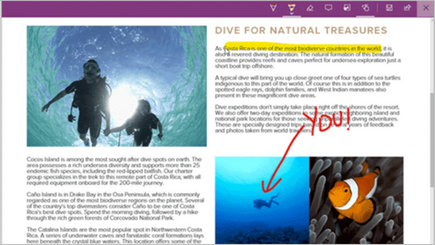 Take notes, write, doodle, and highlight directly on webpages with Microsoft Edge. Select Make a web note. Use the Ballpoint pen to write with your touchscreen or mouse. Highlight screen text, or add a Typed note.